There’s a tradition that all British citizens who reach the age of one hundred years old receive a personal telegram from the Queen. I don’t how she does it these days. Maybe she has a bunch of notifications on facebook and she writes – “yo happy 100th birthday you’re mad old lolz”. I don’t know. 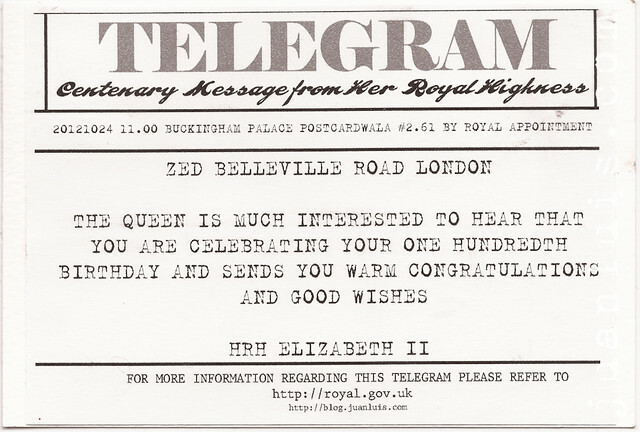 Anyway, my niece was told that her aging cat Zed would be one hundred in equivalent human years approximately around the time of her eighth birthday, so naturally after her recent birthday she wondered why a telegram for Zed had not yet arrived from the Queen. It sounded like a perfect subject for a special postcard. I took the text from real telegrams that I found online.